Read only! All feature requests and suggestions for upcoming releases of Nuendo 6 can be posted here. 1. Bring back the GUI of the previous mixer. Mixing incoming signals to outgoing targets is what CR is all about, just like the regular mixer. If it was such a great thing to do why not do it to the regular mixer? Because it would break with convention and get messy and cluttered. Which is what the CR now looks like. 2. Keep the right side mixer-pane as an option. One doesn't have to exclude the other. You already created it. I can see how it can be useful in some situations. + more Studio Sends would be useful. The Archers - give it a rest already! Omnisphere, Trillian + loads of real instruments. 3 x Nuendo 8.3.15, Win 8.1 64 Pro, 12 GIG RAM, NVS450 GUI, Intensity Pro Video ,2 x WK ID Consoles, 4 x RME Fireface UFX, 4 x UAD-2 Duos, KRK 5.1 Expose 8 Near field Monitoring. Cinema screen Monitoring:Powersoft Amplification, EAW: 3 x CB523M + CB284c & 6 x CR721 Speakers. Wavelab 9,PT 10,Re-voice Pro 4,Basehead 5, RX 7 Advanced,Cedar DNS One & CS8 Studio. Agree completely on both counts. I'm incredibly irritated by you Steinberg people not even responding to this. SUPER ANNOYED. The only reason I'm not using the words that come to mind is that I don't want to get banned. I'm working on short internet-ads for a major brand right now and have to level match to previous mixes. If I want to double check on meters and have the reference mix lined up on a different Control Room source here's what happens. 1. Go to Control Room and click to select reference mix source. 2. Click tab to select meter. 3. Play audio, listen and watch meter. 4. Click tab to get to the monitor selection. 5. Click to select mix source. 7. Click tab to select meter. 9. Play audio, listen and watch meter. Whomever designed this doesn't work with the application and sure as hell doesn't listen to customers. Idiotic doesn't even begin to describe it. Maybe WE are the 'high profile' users! - I can not imagine that there are a whole bunch of 'high profile' people out there that are completely happy with the software, never suffer from the problems we do, and never feel the need to access this forum. Unless of course there is a special 'platinum' version of N6, only available to the very top people, where all problems have been resolved! I to feel that there are major issues With The CR GUI. But the above rant is actually a bit silly. Just have both up..
Have the meter in the mixer and have the separate CR window with all CR functionality open as well. Then you can meter and adjust monitoring at the same time. I consider us a pretty serious user with eight licences at the studio and most of our editors have choosen to own personal/private licenses as well. I don't have that much time to spend here, also I feel that the amount of noise and questions and rants about functionality is made in such childish ways by so many forum participants it really turns me off. This does not mean I don't have issues with certain issues within the development of Nuendo. The fact that we actually still keep working in N5.5 rather than N6 says it all. Im sure i probably sounded like a prick. Sorry about that I didn't mean to. I fully agree that the CR is way worse in N6. But in no way does it stop users from switching monitor sources while watching meters. Users just have to choose to see both at the same time. If that is a wise design decision? That is debatable. But it's not very hard to deal with. Before n6 we didn't even have proper metering. In N5 there is no alternative to use a third party meter any way. fenderchris wrote: Maybe WE are the 'high profile' users! ErikG wrote: I to feel that there are major issues With The CR GUI. How do I create space in the mixer so that the separate CR window doesn't cover things I want to see? Do you "unmaximize" the mixer and resize to fit? ErikG wrote: I feel that the amount of noise and questions and rants about functionality is made in such childish ways by so many forum participants it really turns me off. If you say nothing they will assume things are fine. And if you think my posts are childish then put me on ignore. Or don't bother participating in the threads in question. It's also very interesting to see how some have opinions about how other people express themselves but only in general terms. Feel free to point out exactly where I was expressing myself in a childish way. I'd love to learn exactly where that was. ErikG wrote: Before n6 we didn't even have proper metering. In N5 there is no alternative to use a third party meter any way. That's not correct. Steinberg released their own R128 meter as a plugin. Lydiot, I really wasn't only referring to your post but to general posts on the forum that complains about things that does not work or that does not exist, when the problem is really user error. But yes I was referring to your post as well. In all honesty, in what daw can you see everything YOU want to see, and everything I want to see, and everything Hans Zimmer wants to see at the same time without having any compromises? 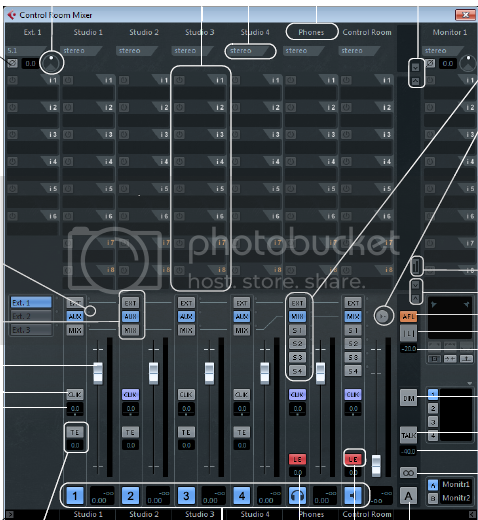 If you want to run the mixer full screen, you have to adapt to the design. I don't agree with the GUI design at all either. But stating it isn't possible when it is, is just not good as it lowers the value and importance of what really is the issue. Being able to see it all In the CR at the same time as we could before is important. But now there are several meter sections as well in addition to all the old functionality. To be honest, there was no way to really view a large expanded CR section, large meters, and a good size mixer on one screen ever. Personally I'd prefer to be able to see both peak meters, loudness and CR functions at the same time. But I would also like to be able to see my mixer channels, plugins, stereo fold down metering, media bay, marker window, pool window, edit channel settings window, floating main panner window and my project window. I would prefer to be able to see them all at the same time. Realistic? Not really is it? So they have to make compromises. I really don't think sharing space between CR and metering is the worst choice, especially within the mixer view. I do think that it all should be able to be viewed at the same time in the actual CR window though. And yes, the general GUI design of the design elements within the CR is awful! Edit: and never forget, this is Nuendo... key commands can control a lot! For example switching sources in the CR without actually having the CR visible at all. Pretty neat I'd say. I'd agree with you if you could put forth even one argument for why the redesign of the Control Room GUI was desirable and requested. There isn't a single thing I can think of that they did that from a GUI standpoint was necessary. If you dig the way it's done now (and you don't, which makes your criticism of my posts "strange") then that still doesn't exclude the possibility to code it so that there's the option to use the tabs or have all extended into one larger section. And this doesn't even address unconventional horizontal sliders with difficult to read text running through them, a standard found, well, pretty much nowhere in professional audio-land. Name dropping a big composer doesn't help convince me that the Control Room GUI is well designed for the dialog editor, the sound designer, the re-recording engineer etc. Good for him that it isn't annoying (we assume). Feel free to like or dislike the criticism. All I have to say is that sitting still and not saying anything while paying them money for the app tells them one thing and one thing only: Keep doing what you're doing. If history tells us anything it is that there's a way to get the oil to the wheel. Not doing anything ain't it. ok here here's a few things that caused these changes. 1• The new design of the mixer is clearly based on a total rewrite that was necessary as the code was old and it was not possible to update it to handle longstanding requests for multiple pre/post inserts etc. 2• The programs GUI design is basically the same for a very long time. With the technical need for new code for the mixer they decided to "upgrade" the GUI quite a lot. Conceptually it was decided it had to be based on a specific idea for a new controller developed by Yamaha. 3• A very long standing user request for years and years especially in the Cubase camp has been for a re sizable mixer. What for, I have no idea. But apparently it was asked for enough that Steinberg considered it a important concept to base the new GUI design around. 4• Other long standing requests have been for better metering. multiple type PPM and digital meters as well as Loudness meters. The old meters in the C/R really were close to useless so any new meters had to replace them. These four points I know are valid. I'm sure there might be others I dont know of. they all affect the choices and design decisions taken by Steinberg devs. I clearly do not agree with them in quite a few different design areas. Would I have been sad if they kept a more traditional Steinbergian GUI design and kept the old CR design but with new and added metering? No I wouldn't. Could I see that they in any way would have been able to do so while making it work with the Yamaha designed controller? Nope. ErikG wrote: ok here here's a few things that caused these changes. How does that necessitate multiple tabs and horizontal sliders? The code for vertical sliders already needed to be written for the regular mixer, correct? So why not reuse that then? Really? Half of the above is just as statement of an irrelevant fact ("they decided to 'upgrade'"). For the rest I see absolutely no correlation between the GUI and Nuage. What does horizontal slider have to do with which section on Nuage? Where on Nuage do we need tabs corresponding to tabs in CR? In fact, I would say that apart from the mixer itself which lays right on top of each channel of the physical mixer buckets, the point is exactly opposite to what you're saying: The whole point of a well designed controller is that you use IT to get both tactile and visual feedback. If I want to change something on the controller I either feel my way to the controller in question or look down. Either way it doesn't need to be exactly the same as what you see on the screen. Just look at the automation section on Nuage: Does it correspond to the layout of the floating automation window in the software? No, not at all. As a matter of fact it's quite different; Fill modes on the controller are horizontal whereas they are vertical in the software. And resizing affects the vertical sliders, which means that resizing didn't have to involve creating horizontal ones. And since you can have either tab open regardless of resizing it only means that each tab can be resized, which in turn implies that they could all be so while all being open at the same time. Again: Doesn't necessitate a drastic redesign of the GUI as far as I can see. It seems to me that you make some points that doesn't amount to the overall conclusion you draw from them. Next update end-of-year if we're lucky. Wonder if we'll see any improvements on this. Horizontal sliders, not faders. Function name written right on top of the slider making it harder to read what the heck you're looking at, instead of under the fader. And yet again more tabs - MORE CLICKING! Totally breaking with mixer and design convention. at around 12:50 you can see a good example of the lack of visual feedback and requirement to click around to get crap done. Not to mention that the whole thing looks like a poorly designed Fisher-Price toy. If it ain't broken..... don't "fix" it. It's only been six months since this thread was started, let's all be patient, right Steinberg? Seriously, how much effort is it to just tell us if you're going to change this or let us suffer through this sucky eyesore? Do we need to campaign these issues more publicly or?